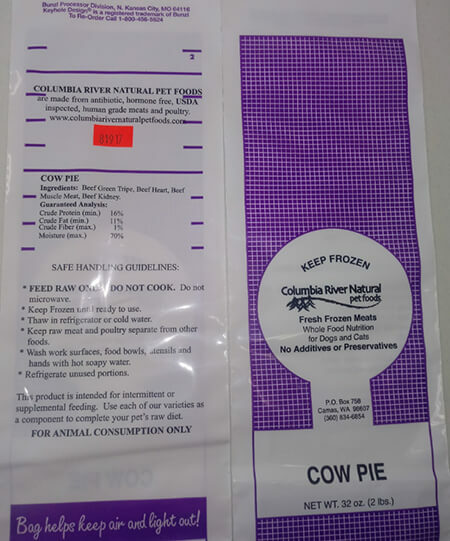 December 5, 2018 — Columbia River Natural Pet Foods of Vancouver, WA, is voluntarily recalling its Cow Pie fresh frozen meats for dogs and cats because it has the potential to be contaminated with Listeria monocytogenes. Listeria monocytogenes may affect animals eating the products and there is risk to humans from handling contaminated pet products, especially if they have not washed their hands after having contact with the products or any surfaces exposed to this product. Listeria monocytogenes can cause disease in humans. Listeria monocytogenes is one of the leading causes of human death from foodborne illness. Listeria monocytogenes infections can also spread through the bloodstream to the nervous system (including the brain), resulting in meningitis and other potentially fatal problems. Pregnant women are more susceptible to Listeria infection, which can result in abortion. The young, the elderly, and people with weakened immune systems also are more vulnerable. Although uncommon, pets with Listeria monocytogenes infections may display symptoms such as mild to severe diarrhea, anorexia, fever, nervous, muscular and respiratory signs, abortion, depression, shock, and death. Animals that recover may become carriers and serve as potential sources of infection to other animals. Cow Pie is a fresh frozen meats product intended to feed raw to dogs and cats. Cow Pie was distributed in Alaska, Oregon, and Washington through retail stores and direct delivery. The product comes frozen in 2-pound purple and white plastic bags, marked with Lot 81917 (processed on August 19, 2017) found on an orange sticker. Consumers who have purchased the 2-pound packages of Cow Pie, with the affected lot 81917, should discontinue use of the product and may return the unused portion to the place of purchase for a full refund. Consumers with questions may contact the company at 360-834-6854, Monday to Friday, from 8 AM to 4 PM PST.